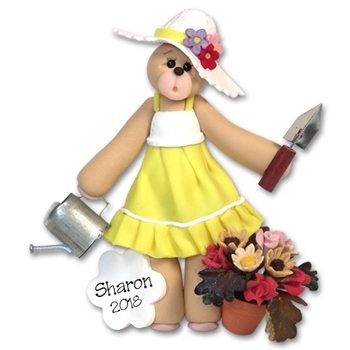 This adorable little GARDENER Belly Bear Girl personalized Christmas ornament is handmade from polymer clay by me. It is one of the original prototypes that were made in 2008. I have used actual miniatures in this piece. The water can is made of tin and the flower pot is actual terra cotta. The flowers are miniatures as well all of which adds to the overall cost of the ornament. There are only a few of them available. It has a natural matte finish and measures 3.5" high by 2.5" wide. Comes complete with a hook and satin ribbon for hanging. This ornament may be personalized to your specifications absolutely FREE!